As was the case with the Half Dime, the Seated Liberty theme was introduced on the United States dime in 1837. The Seated Liberty Dime was minted every year until 1891. The obverse shows Liberty seated on a rock supporting the Union Shield with her name on it. The figure is reminiscent of Britannia as seen on British coinage, just as Mint Director Robert M. Patterson envisioned. The reverse shows the words "ONE DIME" encircled by a wreath and the legend "UNITED STATES OF AMERICA". The Capped Bust design that preceded the Seated Liberty did not use the word "DIME", rather the inscription "10C. ", to designate its face value. By 1837, the word was so thoroughly entrenched in American lexicon that everyone understood how much a dime was worth. It may seem insignificant to us today, but this was a recognition of those living at that time of the continued maturation of the United States and its culture. Similar to its Half Dime counterpart, a number of varieties exists for the Seated Liberty Dime, due to design changes in drapery, stars, arrows, and legend. In the 1830's, President Andrew Jackson strove to put an end to the 2nd Bank of the U.S., pressuring credit markets to collapse and inadvertently brought on hard financial times. Matters worsened in 1836, when Jackson issued the "Specie Circular", which required payment in gold and silver coinage in exchange for federal land, triggering the Panic of 1837. During those economically depressed years, coins largely disappeared from circulation. A large number of privately issued pieces, called "Hard Times" tokens, appeared in response. Above is one of these tokens, called the Feuchtwanger cent, named after the inventor of the "German silver" alloy used in the token, Lewis Feuchtwanger. His alloy actually contained no silver, and at one time was considered for regular US coinage, but was ultimately rejected. There are a few challenging dates in the Seated Liberty Dime series. The rarest of all is the 1873-CC with no arrows. The only known example of this famous date resided in the U.S. government coin collection until 1914, when it entered the private sector, and was sold the following year for $170. In 1950, collector extraordinaire Louis Eliasburg purchased the coin for $4000, making it the final entry necessary to complete his entire collection of United States coins, the only such set ever assembled. 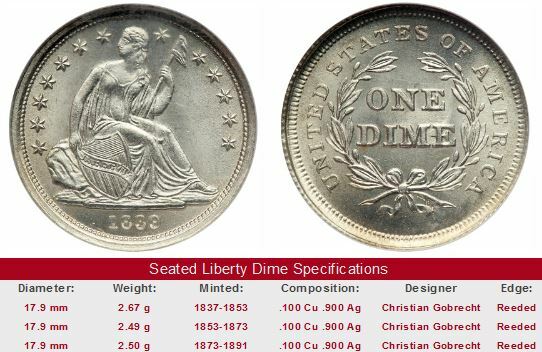 The 1873-CC no arrows Seated Liberty Dime was last sold in 2004 for $891,250. The links below will take you to eBay coin auctions for the Seated Liberty Dime key dates of 1871-CC and 1874-CC. Because of their scarcity, you may not find an example for sale every time you check. The 1872-CC and 1873-CC are close cousins of the above and possess similar potential. The left hand side of each "Sales Box" is value trend data over a very long period of time for the date headlined, in G-4 condition. The percent annual increase is computed for comparative purposes. The coin pictured for sale in the right hand side (if any) is not necessarily an example in G-4 condition.